168 pages. Illustrated in colour throughout. Hardcover with dust jacket. This catalogue was published on the occasion of the exhibition Richard Prince: Protest Paintings and is accompanied by Richard Prince's essay 'Half- Mast', an extract from his memoirs “Tell Me Everything”. This is the first publication dedicated to this seminal body of work realised between 1989 -1995. 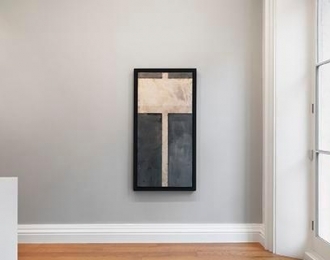 Painted onto a vertical canvas in the shape of a protest placard, the Protest Paintings alternate between monochromatic minimalism and richly layered colourful abstraction. Incorporating printed and handwritten jokes, as well as mined pattern details silkscreened onto the canvas, these paintings exemplify Prince’s practice of appropriation. Subverting the use of symbols, texts and gestures, the paintings are not only a response to the social and political climate of the post-war era, they emphasize the inextricable web of politics, patriotism and devotion at the heart of American identity. Featuring paintings from public and private collections, this catalogue demonstrates the breadth of Prince’s creativity in this singular body of work.